When I began to deal with the Piano Concerto and the Concerto for Orchestra, I kept finding that I was writing the same chord plans over and over again in order to find the relationship between them. And so I decided to write out something that was more or less permanent and organized so I wouldn’t have to constantly go back and do it over and over again. The straightforward title and colorful cover of this volume drew my attention when I happened upon it in the library of the San Francisco Conservatory of Music. I have long been an enthusiast and performer of Carter’s music, in particular the first four string quartets, and have worked with the composer on a few occasions, and this book appeared to be a simple manual revealing the composer’s methods and intentions. When I opened it however and scanned its pages, it displayed a staggering and bewildering array of hundreds upon hundreds of chords, each numbered and categorized according to the composer’s own system. The editors’ introduction, and a discussion in which Carter talks about the book are worth the price of admission to this otherwise daunting volume. 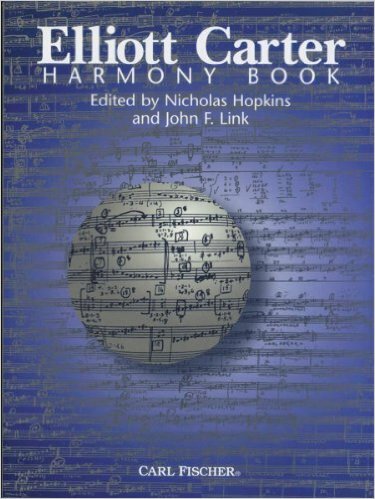 With its hundreds of pages of chord charts the Harmony Book seems at first to be nothing more than a statistical table of combinatorial possibilities, the product of an actuary, rather than an artist. Each of the twelve 3-note chords, twenty-nine 4-note chords, etc. is systematically dissected—its supersets synthesized and subsets analyzed—but there is nothing to suggest how this voluminous statistical still-life relates to the mercurial flow that so strongly characterizes almost every piece by Carter. But a closer look reveals deep connections: the actuary and the artist turn out to be oppositely charged elements of a single musical imagination, and their collisions provide the energy that drive’s Carter’s music. The book is organized into two volumes. The first, chapters 1-8 provide a catalogue and synthesis (the composition of a chord by mean of combining two intervals or chords.) Thus, adding a 5-note chord to a 2-note interval would synthesize a 7-note chord (5+2=7), and adding a 3-note chord to a 4-note chord, (3+4+7) would synthesize a 7-note chord, as well. The first chapter gives a convenient and manageable means of notating all possible intervals and chords, from 2 to 10 notes in the 12-note chromatic scale. There is a total of 220 intervals and chords, each of which is then given a catalogue number. Chapters 2-8 provide six exhaustive syntheses arranged according to expanding chords. Synthesis I explores chords generated by the numbers 1+3=4, 1+4=5 etc., Synthesis II yields 2+1=3, Synthesis VI yields 6+1=7, etc. In volume II the reverse process, analysis is undertaken. Here the division of chords into subsets is given. Thus a 7-note chord would be analyzed as a 6-note chord plus single note (7=6+1), or a 5-note chord plus 2-note interval (7=5+2), or a 4-note chord plus 3-note chord (7=4+3). Chapters 9-13, (Analysis I-V) are dissected chords of 3 to 8 notes. This is a basic, simplified but hopefully adequate account of the organization of the book. The way the project began reflects Carter’s common-sense approach to compositional problems. Carter was a visiting professor at Cornell University in 1967, and he filled in his time, frequently while commuting by train from New York, by writing this book. “I didn’t like doing it, frankly. It bored me terribly, but I also found it simplified my life, once it was done.” The study began with 3-note chords (for the Piano Concerto,) and expanded to 4 and 5-note chords for the Concerto for Orchestra. The numbering of the chords enables the composer to oversee the harmonic process through the ability to quickly track the chord he is using. In the analysis volume, which lists the subsets or parts of a chord, Carter says, “This was something that I carried out, so that I could know how I could, let’s say, modulate from one sound of harmony to another, while maintaining one, two, three or four notes.” For example, with a 4-note chord you might find a 3-note chord within it to use as a set of common tones to modulate to another chord containing those same three tones…”The idea was how you could move from one world of sound to another smoothly, so that it sounded as if it had a logical connection,” according to Carter. I have a memory of Elliot Carter at the American Academy in Rome in 1961, while he was working on the Piano Concerto. In the month spent working there with the Lenox Quartet, of which I was the violist, I saw Carter often, and once, upon entering the Villa Aurelia where he lived, I saw him quickly put away a set of charts on the piano, almost as if he were concealing his “actuarial” material. In the past, his desire to be fresh and individual led, I think to his being guarded, not only about his ideas of order, but also his source material. Any lover of the music of Charles Ives will recognize his influence on Carter’s rhythm and harmonic sense. Carter spent some time with the craggy Ives while he was a high school student at Horace Mann School in New York in the 1920’s, and Ives wrote him a letter of recommendation to Harvard College. Yet Carter wrote a scathing review of Ives’ Concord Sonata when John Kirkpatrick premiered it in New York in the mid-1930’s. He could find no order in what he perceived to be the chaos of the piece, even on repeated hearings. Today his views on the subject of Ives have changed, and his sharing of this book seems to suggest that here, too he has had a change of heart, and now believes that excellence is borne out of talent and order, not secrets and magic. With the appearance of the Harmony Book, enthusiasts imagined a collection of almost mystical documents, like Prospero’s books or the Rosetta Stone, with the power to unravel Carter’s harmonic language. The reality is less sensational. There is no “secret” of Carter, any more than there is a “secret” of Shakespeare, Cezanne, Mozart, or for that matter Stradivari. Hopkins: It’s interesting that you moved away from that kind of formal structure at about the time the Harmony Book was completed. Carter: That’s right. I didn’t feel that was what I needed to do. I was more concerned with the general big sweep of the piece, and how one produced the general main effect, rather than these small detailed matters. I don’t know. Different ideas come to me at different times. I can’t explain it more than that. Not long after this conversation, I was surprised to receive a large package in the mail from Elliot Carter. It contained the most recent edition of the Harmony Book with numerous corrections. That he would so casually send his personal copy I took as further evidence that the Harmony Book no longer played an active role in his composing. But a week or two later I got a phone call from Mr. Carter asking me to send it back as soon as possible. ‘I’d forgotten how much I depend on it,’ he said.